Posted September 26, 2018 by finnfemme & filed under Beauty, Fashion, Vintage. 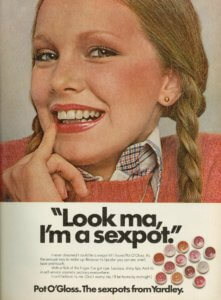 I thought I’d exhausted every last Yardley Pot O’ Gloss ad from the 1970s, but I FOUND ONE MORE! This ad is from 1976, when the whole Yardley of London thing was ramping down and it was just plain old Yardley. Yardley was going through major changes to their makeup line at this time, but it seems that they were holding onto Pot O’ Gloss for a bit longer. Pot O’ Gloss was touted as a sensual way to make up. Because it was lip color you could see, smell, taste and touch. With the flick of the finger, you had ripe, luscious, shiny lips. All this apparently earned Pot O’ Gloss sexpot status in 1976.